Darband and Elahiye district in 1957. Amjadiyeh pool and sports complex in 1958. The Saadi Theatre – note patrons checking showtimes at panel. The smaller sign situated just at the right of theatre sign is “Bank e Melli Iran” (National Bank of Iran) (Photo from Getty Images – Published in Avaxnews.com). Naderi Avenue in the winter of 1951. Naderi avenue in the fall of 1953. The Bank Melli (National Bank) of Tehran. Note how the architecture blends elements of ancient pre-Islamic Iranian motifs (Photo by Three Lions/Getty Images). A Tehran schoolgirl in the early 1950s at a vocational training school for seamstresses (Photo by Three Lions/Getty Images). She is studying a physics book. Enjoying an outdoor shave in Tehran in 1958. Shahr e Farang in Tehran in 1958. Mehrabad Airport check in terminals in 1958. The report below by April Holloway regarding the excavation of a large ancient gate at Persepolis appeared in the Ancient Origins outlet (November 17, 2014). Reports of these findings also appeared in Mehr News. Excavations at Persepolis, a magnificent palace complex in Iran founded by Darius the Great around 518 BC, have uncovered a great ancient gate in Tale-Ajori, within the Firouzi Complex. Even older than Persepolis itself, Tale-Ajori lies 3,500 meters outside the city and is of great significance for understanding the Achaemenid Empire. The glazed bricks of the site reveal much about the mythology of the era, while the discovery of the new gate may shed new light on the role Tale-Ajori played within this ancient landscape. 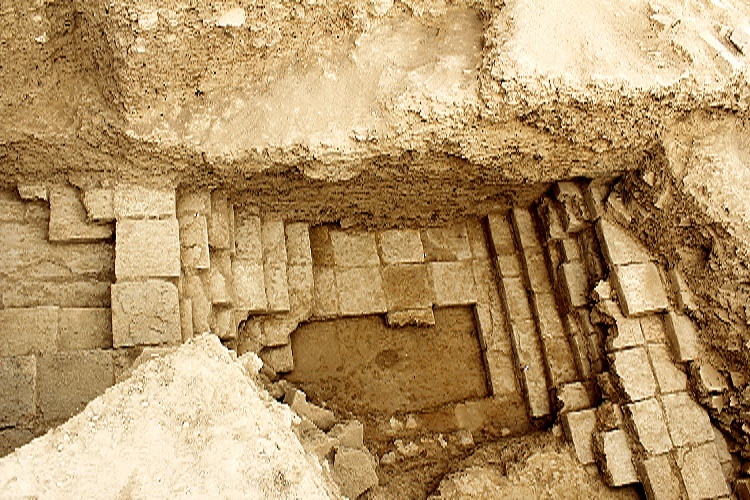 According to Mehr News, the finding of the gate was made by a joint Iranian and Italian expedition team, who carried out excavations over the last two months in the area of the Firouzi Complex, which they believe was part of a city relevant to the royal seat in Persepolis. Tole-Ajori itself is an ovoid mound 80 meters (260 feet) long and 60 meters (200 feet) wide, and is believed to be the site of a single large building, although its original function is still unknown. “The remains of Achaemenid ascendancy near Firouzi village has only gradually attracted interests of the archaeologists who studied the areas surrounding the royal seat to locate the Royal Sacred Place in the broader limits of the city for nearly 100 years”. Through the combination of excavations and geophysical surveys, the research team has been trying to piece together the spatial layout across the 10 hectares of archaeological sites near Tale-Ajori, as well as the conceptual links between the royal construction and the surrounding buildings. Persepolis was founded by Darius the Great in 521 BC, and was the dynasty’s political and religious capital up to the decline of the empire in 331 BC. It sits within a large urban landscape of Achaemenid palaces, monuments, and buildings extending across 600 hectares. The wealth of the Persian empire was evident in all aspects of its construction. The splendor of Persepolis, however, was short-lived, as the palaces were looted and burned by Alexander in 331-330 B.C. Reconstruction of the gardens and outside of the Palace of Darius I of Persia in Persepolis (Public Domain & Ancient origins). The lectures will be delivered at the Tapestry Center in the University of British Columbia’s Wesbrook Village. For information on registration, etc., kindly contact the University of British Columbia-Continuing Studies Division. Tajik girls celebrate the Iranian Nowruz (New Year) on March 21, 2014 in Dushanbe, Tajikestan. The curriculum and impetus of this course is the direct outcome of meetings with the Cultural Diplomacy’s Department of Traditions & Cultural History of the WAALM Academy based in London, England. WAALM is affiliated with the Academic Council On The United Nations System (ACUNS) and The International Peace Bureau. WAALM was nominated for the Nobel Peace Prize in 2011. Kaveh Farrokh has been featured in WAALM’s Tribune Magazine (click here…). Chinese painting of Leizu (Xi Ling Shi) the ancient Chinese empress credited with inventing silk in c. 2700 BCE; she was the teenage wife of the Yellow Emperor Huangdi. The “Shir Dar” (Lion Gate/doorway) of the Islamic college at Samarkand built originally in 1627 (Nafīsī, 1949, p. 62). The sun motif is characterized by Kriwaczek (2002, picture Plate 1) as ”…the image of Mithra, the rising and unconquered sun, Zoroastrian intercessor between God and Humanity” (Courtesy of Kriwaczek, 2002). Chinese women produce silk in the 12th century CE. Kyrgyz musicians performing with traditional instruments. Hsiang-Nou races replaced Iranian speaking peoples of Central Asia; Despite this: These greatly assimilated the cultural and mythological traditions of their Iranic predecessors. The above video (also available in Russian, Turkish, and Persian) documents the process of historical revisionism that has been taking place with the Baku establishment of the Republic of Azerbaijan. Note that the latter was named as “Azerbaijan” in May 1918; prior to that date this south Caucasian region was known as the Caucasian Khanates (i.e. Ganja, Sheki, Shirvan, Darband, Mughan, Kuba, Baku, etc.) and/or Arran. The historical Azerbaijan or Azarbaijan was located (according to cartographic and primary sources) below the Araxes River in Iran. The video has been well-researched and documented. The book has been translated into English by Dr Ara Ghazarian of the Armenian Cultural Foundation of Arlington Massachusetts. it must be noted however that this project was initiated and finally made possible through the hard work and dedication of Rouben Galichian, an accomplished scholar in his own right. “Azerbaijan and Aran (Caucasian Albania)” Published by Bennett & Bloom, London, 2014, 174pp with 12 colour plates. Price $25 or £20. The book has so far been translated into Armenian and Russian, but until now there had not been an English translation of this extremely valuable work. This gap had to be filled and Galichian decided to act upon it. In 2008 he spoke to Professor Reza asking his permission to translate the book to English, to which he graciously consented. Galichian began the hard work of the translation but due to other urgent projects and commitments the partially completed work had to be abandoned. Rouben Galichian at the opening seminars in November 1, 2013, at (بخش ایران شناسی دانشگاه دولتی ایروان) the University of Yerevan Iranian Studies Department entitled “Shirvan, Arran, and Azerbaijan: A Historical-Cultural Retrospective” conference (kindly click here for more information on all conference participants and their topics). Galichian has written numerous books outlining the history and cartography of the Caucasus. He is also the author of a number of cartographic articles published in various magazines and has lectured extensively in Europe, the USA, Iran and Armenia. For his services to Armenian historical cartography, Rouben was awarded an Honorary Doctorate by the National Academy of Sciences of Armenia in November of 2008. In 2009 he was the recipient of “Vazgen I” cultural achievements medal. He is married and shares his time between London and Yerevan. Kaveh Farrokh wrote a review of Galichian’s recent text “The Clash of Histories in the South Caucasus” for the prestigious IranNameh Persian language journal. Then, in 2011, Galichian heard from his friend and scholar Dr Ara Ghazarians of the Armenian Cultural Foundation of Arlington Mass., that he has started the translation of Dr. Reza’s work. Galichian encouraged him and promised to locate suitable maps for the book. Afterwards, Galichian assisted in getting the financial backing and the publication for the English translation of the book. This has resulted in Dr. Ghazarians’ excellently translated and beautifully produced book, to which he has added important explanatory footnotes and complementary information. Dr. Ara Ghazarian, curator of the Armenian Cultural Foundation in Arlington, Massachusetts. Ghazarian holds a PhD in international relations from the Fletcher School of Law and Diplomacy, Tufts University. Editorial assistant and manager of the Armenian Review (1987-91) and Director for Resources and Archives of the Zoryan Institute (1989-90), he has been on the faculty of the Emerson College (1984-1998) and translated and edited nine books, among them Heinrich Vierbücher’s Armenia 1915 (2006) and Murad of Sepastia by Mikayel Varandian (2006), Jakob Künzler’s In the Land of Blood and Tears (2007), The Widening Circle and Other Early Short Stories by prolific Armenian writer and journalist Hakob Karapents (2007), and The Astrologer of Karabagh by the nineteenth century Russian novelist Platon P. Zubov (2013). Historic defeats of the late Qajar period resulted in loss of territories for Iran to its north and east. In the early decades of the twentieth century, a group of political leaders in the historic Aran (Caucasian Albania), to the north of the Araxes River, which, during the 17-19th centuries was known as Shirvan, renamed their country Democratic Republic of Azerbaijan. Ottoman map [Click to Enlarge] outlining Western Iran and the Caucasus in 1893. Note that Azarbaijan is clearly shown to be the land below or to the south of Aras (Araxes) river – the territories corresponding to the present Republic of Azarbaijan were not known as “Azarbaijan”, but variously as the Caucasian khantes (i.e. Baku, Sheki, Nakhchevan, etc.) or as “Albania” or “Arran”. Prominent Iranian scholar and historian, Professor Enayatollah Reza (1920-2010), based on extensive research of historical geography of Iran and the Caucasus, provides a picture of the boundaries and the two territories of Azerbaijan to the south and Aran to the north of the Araxes River, respectively, and the advent of the Turks on the world stage, their movement and penetration into Azerbaijan, the Caucasus and Anatolia. A chapter in this book discusses the cultural character of these lands at the time of the arrival of the Turks, followed by a response to the claims of the Pan-Turkist historians in Turkey and Azerbaijan, who claim that the Turkish racial element had been present in these territories before others. Other topics in the book include a discussion of the arrival and incorporation of the Turkish language in Azerbaijan and the Aryan roots of the people of Azerbaijan upon whom the Turkish language has been imposed. A post-Soviet era propaganda map produced in Baku. The above map (click on the above map to see the video) promotes the false notion that a “Greater Azerbaijan” was divided in two by Russia and Iran in 1828. Historically false claims such as these were first promoted by the pan-Turkists of the early 20th century which were then propagated by the former Soviet Union and the Communists, notably Joseph Stalin and Mirjaafar Baguirov. Unfortunately the legacy of historical amnesia has continued to persist at the official level in the Caucasian state. The book consists of the following main chapters.